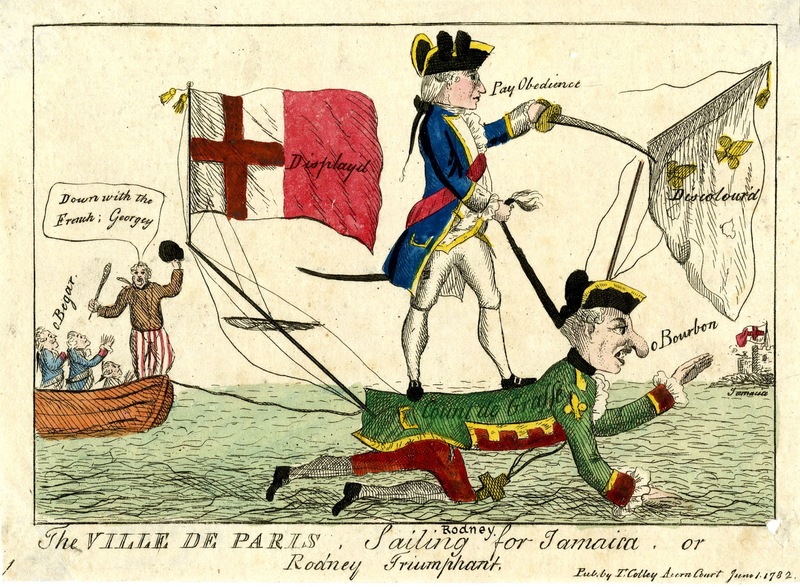 The Ville de Paris, sailing for Jamaica, or Rodney triumphant, Thomas Colley, 1782, British Museum. The victory of Rodney over the French fleet in the Caribbean was a much needed boon for the morale of the British people in the final years of the American Revolutionary War. 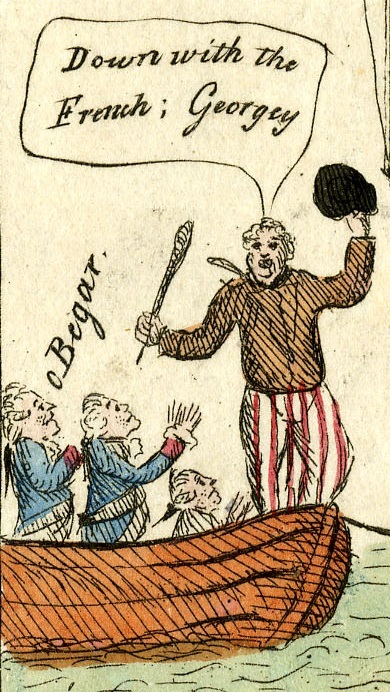 His image, and those of the brave Jack Tars that made it possible, appeared in numerous political cartoons at the time, many of them as crudely illustrated as this. 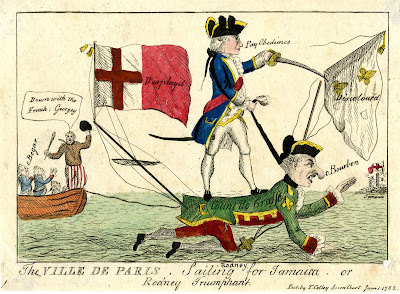 While cutting down the French colors, Rodney holds of the stereotypical long queue of a Frenchman, here helpfully labeled "Count de Grasse," forcing him to carry a boatload of captured French soldiers under the watchful eye of a British sailor. The jack shouts aloud: "Down with the French ; Georgey." Typical of satirical images, there's plenty more symbolism here: the Catholic cross dragging on the sea, the bowspirt with English colors protruding from the Count's rear, and the distant British fort on Jamaica. At the bow of the boat stands our sailor. In his right hand he wields a cudgel threateningly over the French prisoners. In his left hand he waves a round hat. At his neck is a neckcloth, but too small of us to draw any conclusions about its color or pattern. A single breasted brown jacket is fit over his red striped trousers.